I recently bought a terribly expensive Vitamix blender in a quest to sneak more vegetables into my diet. I can get almost a days worth of veggies past my lips if they are blended with fruit so I don’t taste them. I felt like I needed to get fancy since I bought a fancy blender so I got thinking about smoothies that I could share with Chester and Gretel. I thought that making a smoothie for all of us would be a fun way we could all get more veggies in our diet. I looked up the ingredients of my favorite green smoothie to make sure that none of the ingredients were harmful to pets (and they weren’t). I made it the other day and gave it a doggie taste test. Chester and Gretel approve. It’s not something I would give them every day but it is a fun treat. *one or more ingredients can be frozen to make the smoothie colder. I like mine really cold but only use one two two frozen ingredients when I am sharing the green smoothie with my dog so ensure it is not too cold for them. Directions: Put everything into a blender and liquefy. This green smoothie recipe will make approximately 19 oz. I give Chester and Gretel 2 – 3 oz each and drink the rest myself. 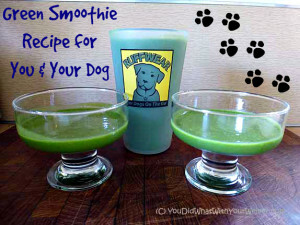 For more ideas, check out the Irresistible Green Smoothie Recipe for Dogs from IrresistiblePets.com. I think I am going to try that one next. Disclaimer: This is a smoothie recipe I created to share with my dogs. I am not a nutritionist nor a veterinarian. It may or may not work the same for your pet. Always check with your vet when adding anything new to their diet. Yummm, we would like those for sure. I meant “fresh” fruit…not free fruit. LOL….. I wish….not in the desert…. I buy fresh kale and freeze it. I used to put it in fresh but a friend told be to freeze it because it blends smoother when it does. Love our Vitamix. My in-laws bought ours as a wedding gift, so I didn’t have to pay for it thank goodness. Are Chester and Gretel afraid of the noise? Silas has gotten used to ours, but he’s still nervous about it. My husband runs it until the noise almost makes me crazy. His smoothies are always perfect. Mine have a few chunks of fruit. I don’t really know how it stacks up to other blenders these days. 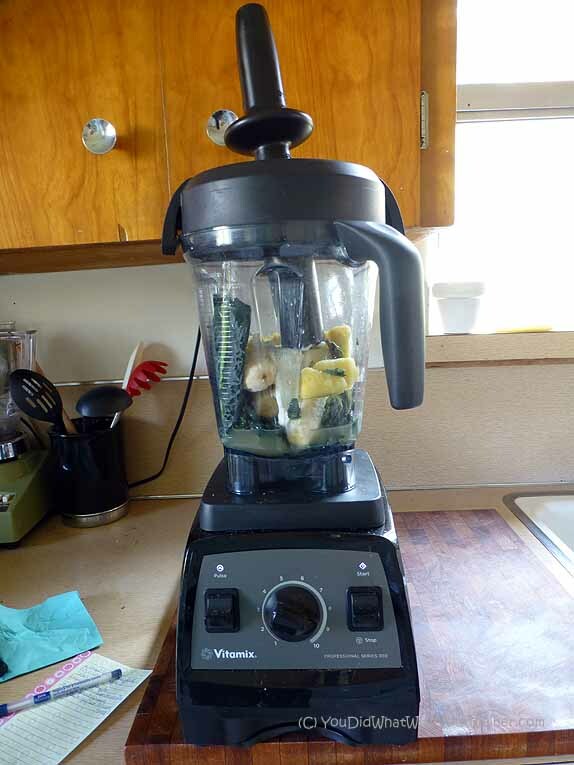 I suspect that cheaper blenders have improved a lot as a result of the Vitamix pressure on the market. We have a nearby restaurant that serves green shakes. I don’t know if I will ever get the nerve to go there and drink something that has kelp in it. Kelp? I haven’t seen smoothies around here with kelp in them. I was skeptical of kale and spinach at first but it is pretty easy to cover up the taste with fruit. Great recipe!! Thanks for sharing!! Looks like the pups enjoyed it especially!! We bought one of the new Magic Bullets that’s for smoothies and I’m going to make this for our pack this weekend. Thanks! I thought about the Magic Bullet. WAY cheaper than Vitamix and I hear they work good. You have to make smaller portions at a time though right? We can make a smoothie for both of us at once. It’s pretty great. Perfect for two people – plus it’s fast so I love it for cooking for the dogs. I can blend veggies and fruits fast and fresh. 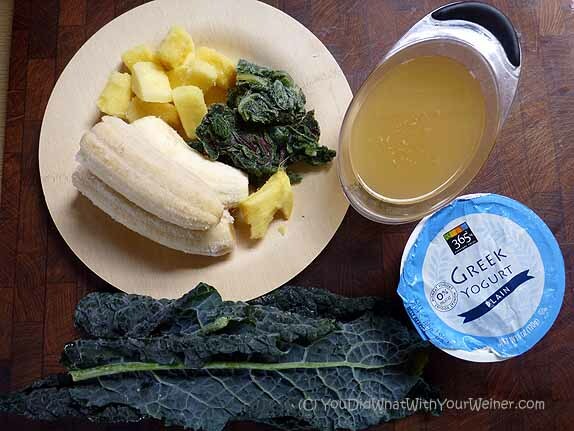 Can’t wait to try this green smoothie ! Sounds yummy! Check out the Ninja Ultima, about half the price of the Vita Mix and has great reviews. Has a 72oz pitcher and also has personal cups that can be used on same base. I am hoping I get one for my b-day on Friday. 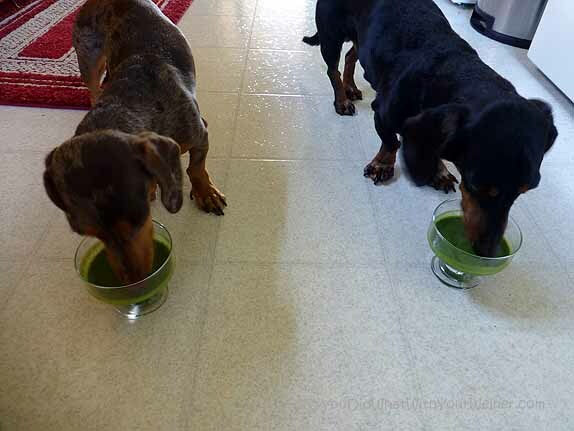 I have never thought of smoothies for my doxies, I am going to have to try some. Blender could also make some cool puppy popsicles this summer. I’ve also frozen doggy smoothies into ice cubes for a small treat. I have an 8 lb Bichon who will eat almost anything, I cook for her, mostly chicken and vegetables. She will eat salad (no onions) – even lettuce – as long as it has a little dressing on, not the creamy kind. I love HER sooooo much, that I never feed her any kind of purchased dog food. NOW – recently I’ve been making morning smoothies, with fruit, oat milk, few soaked almond, little cranberry juice, and spirulina, maca , r, flax seeeds, chia seeds, and hemp hearts. My little darling is 10 years old, seems like it might be a good idea to give her a little of my smoothie everyday, Oh just about 2-3 tablespoons, SHE LOVES IT. I cant seem to find any info online about if this is okay for a dog…… Anybody know anything about that ? Hi Surati. I am not an expert in dog nutrition so I had to ask my friend. This is what she said regarding the ingredients: “There’s nothing there that’s dangerous per se. I wouldn’t give it to dogs with kidney issues because Maca is high in phosphorus though.” Also, both her and I were more concerned about the calories in it. Between the oat milk, almonds and the juice there are a number of calories in the smoothie and a couple tablespoons can mean a lot of calories for an 8-lb dog. As long as she is at a proper weight though (can feel her ribs pretty easily through her skin) it shouldn’t matter.